The promulgation of universal joy. By eradicating guilt and promoting universal joy, we aim to end prejudice and intolerance towards those who 'dare to be different'. 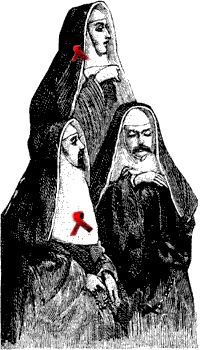 By manifesting in habit, the Sisters and Brothers challenge gender stereotypes and the oppression of organised religious orthodoxy, which still refuses to accept queers (or, indeed, anyone living an 'unacceptable' lifestyle) as being equal members of society with a right to their sexuality. The Order is not a religious order, nor is it anti religion. Many within the Order observe a religious or spiritual life. Others do not. The Order is open to all who feel the call of the habit. We celebrate at public events. We demonstrate. We perform queer affirmative ritual, do fund-raising, perform memorials and generally drag up in habit at any invitation.